A series of bizarre deaths of pretty young girls are plaguing the village surrounding Prince Anton’s castle. He offers Céline and Amelie permanent protection if they can use their "skills" to find the killer. The Mist-Torn Witches by Barb Hendee is a well-constructed fantasy with two likeable, and interesting main characters. 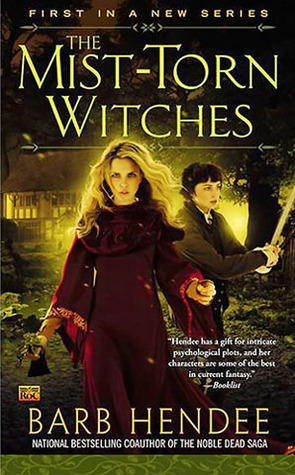 The story relies firstly on the world-building that Hendee has done, and more heavily on the sisters, Amelie, and Celine, whose story is followed from a very young age when they lose their mother and have to figure out how to survive on their own. One of the sisters, Celine is pretending to take after her mother in being a Seer and apothecary. But, while Celine is only acting as if she has the gift at first, it appears that some things come to those who act like they already have them. Suffice to say, Celine is soon coping with the Sight and running her mother’s apothecary shop with the help of Amelie. Having learned to protect themselves while literally trying to survive, they depend heavily on one another, and have to grow up fast. They aren’t all-powerful, and don’t think that’s in their future, but what they lack in power, they make up for in grit, and their love for one another. Celine is coping with her gift as well as trying to take care of her sister, making mistakes and trying to do better the next time. Amelie is, in contrast to her sister, much more of a tomboy, interested in legends, magic, and the history of their family, which figures heavily into the plot. She’s something of a card shark, and doesn’t care for getting dressed up in nice clothes when she can do something more rough and tumble instead. The secondary characters include a prince in jeopardy, which is a nice switch from the traditional ‘prince saves damsel’ trope, and the sisters are determined to get to the truth, even when things get increasingly dangerous for them. While there is no outright romance in this book, the author has laid what is likely the groundwork for that in future books, and hopefully it won’t take away from the focus on Celine and Amelie. This is one book where two sisters are not only united, but help others, and combined with a vivid world, and a prince who needs to be rescued, it makes for a fun read.